By now you are probably aware that I am in love with small format art, and perhaps I’ve even managed to give you the bug too. Perhaps, you’ve signed up for my new class, Fluid Art, which teaches how to use high flow acrylics on tiny pieces 3 inches or less and you are eagerly awaiting it’s release Monday, July 10th. (Yes, Monday!) 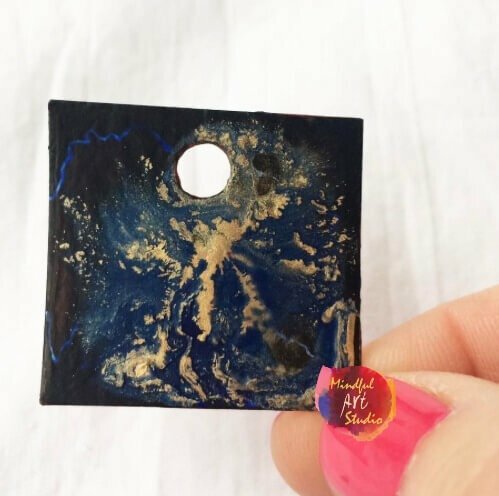 But perhaps you are new here, or perhaps you haven’t yet experimented with tiny art to see how it strikes you and how it might affect your creative self-care practice. Either way, I’d like to invite you to consider some of the benefits of small art. Let me tell you a bit about why I believe in the power of working small. Of course I understand that it may not be for everyone, nothing is, but before you close yourself off, I’d invite you to stay open to the possibilities. Many of us struggle to find the time and motivation to create. Work, family, house cleaning, and other responsibilities seem to get in the way and always take priority. Making art often feels like an art “project,” or chore – instead of a joy or a release – it takes a large chunk of time to set up, complete, and clean up. If I approached my art practice this way, I don’t think I’d make a tenth of the art I make. A big part of what I teach you to do through the Fluid Art process is to weave shorter art making sessions into your day, in a natural way. I’ve seen how if you work small, carry a portable art kit, work in stages, focus on process instead of product, and produce a lot of little works, art becomes an ongoing, accessible, and relaxing process that yields deeply satisfying, soulful art. I’d love for you to develop this practice too. To help kick off the release of Fluid Art, I’m running an “Inchie Challenge.” Participating is very simple. Just create an art piece that is two inches or smaller. You might like to take it to the next level and pay attention to your experience while you work – What comes up for you working small? What do you notice about what you hear? Feel? See? Can you hear your breathing? Can you feel the pressure of the pen or brush in your fingers? This is a way of making your art making a mindful, soothing act. Or, you can just let go and see what flows out. There’s no right or wrong way to create. Work small: Use a 1 to 2 inch piece of paper. Forget perfectionism: Your job is not to make “gorgeous art,” its to show up and make something inside of that inch, even if it’s just a color. Explore a new medium – Use the inchie challenge as an excuse to try a new supply or technique such as watercolor, ink, hand drawn patterns, or tiny cartoon animal drawings. Of course if you are taking the class, post those mini masterpieces! Post your inchies on social media using hashtag: #mindfulartstudio and share in our private Facebook group, Creative Self-Care. Just to make the challenge even more fun, I’m offering a free spot to one lucky random winner out of everyone who posts their inchies on social media between Monday, July 10th and Friday, July 14th. Just be sure to tag #mindfulartstudio on Instagram or post it in Creative Self-Care on Facebook. If you’d like to learn more about the Fluid Art e-course, just click here to check out the Fluid Art video and learn more. It’s on pre-sale pricing of $99 through 7/9/17 – so if you are thinking about taking the class, don’t put it off any longer, click here to register. 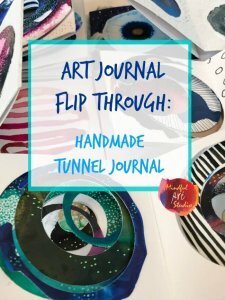 You can also check out the tunnel journals I made using the techniques from the class here. 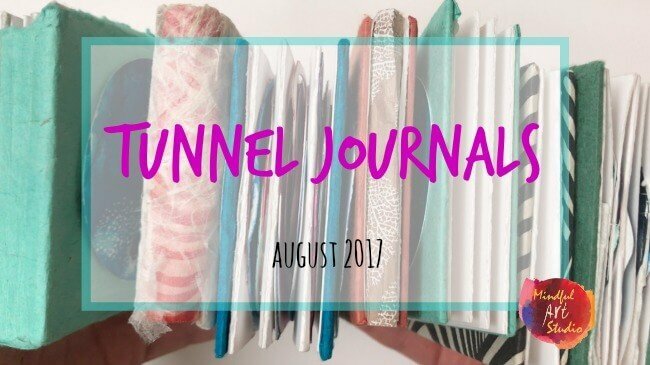 All of the pieces are 3 inches or less and the journal itself is 3 inches tall. All right! Let’s get creative! I hope I’ve stirred your creative juices a bit. 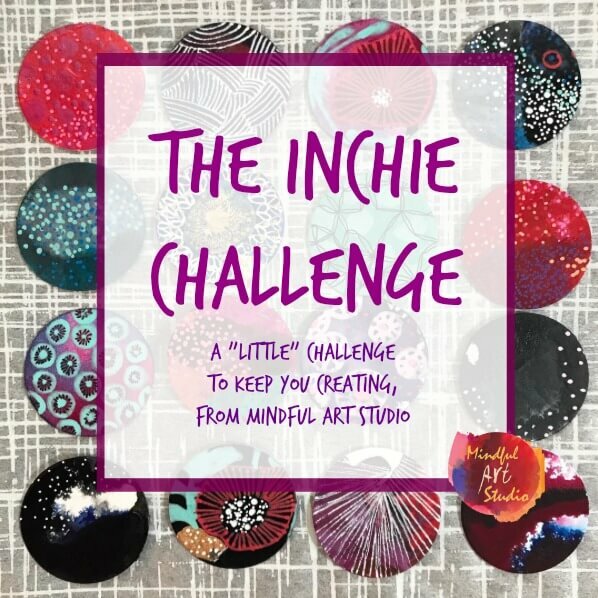 Join the Inchie Challenge and go make some inchies! And post your results. YAY. *Some of the links in this post are affiliate links. 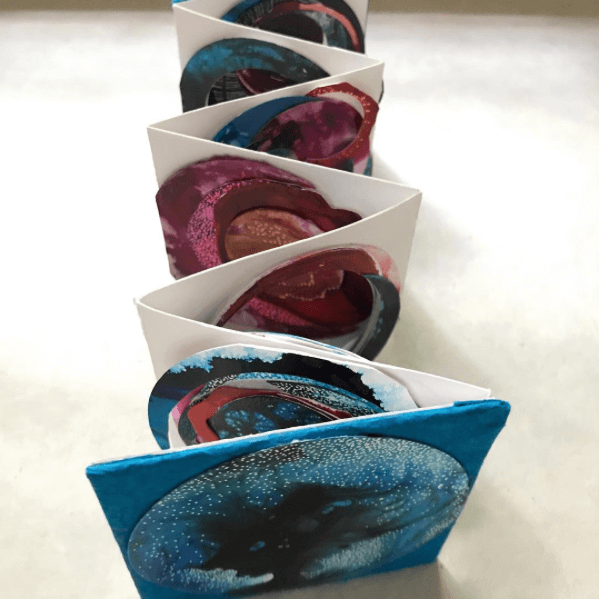 This means that if you choose to click a link and purchase something, at no extra cost to you, a small fee will go to support the work of Mindful Art Studio to empower the artist in all of us. Thank you!